Reviewed by Anna Reynolds Cooper. Anxious perfectionist types should probably avoid seeing Whiplash, an excruciating filmic portrait of how far wrong such tendencies can go at the hands of a punishing, abusive mentor. 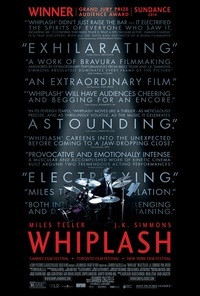 The film stars the young, solemn Miles Teller as Andrew Neiman, a freshman jazz drummer yearning to make a name for himself at the Shaffer Conservatory in New York (fictitious, but too close for comfort to Julliard). The dour leader of the school’s premier big band, Terence Fletcher (played by the coldly excellent J.K. Simmons, recognisable from his longstanding role as a criminal psychologist in Law and Order: SVU,), has the power to make or break the career of any student at the school, and students are desperate to get his attention. Andrew catches Fletcher’s eye while practising on his drum kit one night and, although the bandleader downright insults the young man’s abilities, he soon recruits him for the band - seemingly for the pleasure of having fresh blood to exploit and manipulate. The band plays with amazing virtuosity, winning all the big jazz competitions, but its young members are terrorised and dominated by Fletcher in ways that will be familiar from cinema’s most sadistic drill sergeants (I’m talking Full Metal Jacket here), trembling and weeping in his presence. And so the mind games begin. Fletcher’s favourite trick is to angrily admonish his students based on how they play tiny fractions of a bar, in one case expelling a young player from the band simply because he isn’t sure whether he is in tune or not. He belittles, humiliates, and throws chairs at the players, all in the name of inspiring excellence. At one point he pits Andrew and two other drummers against each other in a brutal all-night competition for the role of lead drummer. Andrew becomes increasingly consumed by the task of meeting Fletcher’s preposterous demands, practising until his hands bleed and shutting out his girlfriend and father in pursuit of an imagined perfection. It’s harrowing to watch as Andrew descends into an anxiety-fueled madness. The film is the promising directorial debut of Damien Chazelle, a millennial who once had dreams of becoming a jazz drummer. Although the film’s portrayal of the anxious competitiveness of performing arts milieux is, like Black Swan (Darren Aronofsky, 2010) before it, a little on the exaggerated side, its exploration of the psychological effects of this world on the individuals struggling within it is intense and visionary. Yet it does so without the raving hallucinations found in Aronofsky’s film, which makes it a different kind of experience and if anything even more gut-wrenching to watch. Just keep in mind that you might need an emergency appointment with your therapist the next day. This review was published on January 18, 2015.